Sgraffito is an old technique which involves scratching through a layer of lime plaster to reveal a different coloured layer below. It is a bit like scraperboard! It has been used since classical times and was popularised in the 15th and 16th centuries and again during the Art Nouveau era. It is used in fine art, decoration of building facades, and pottery. For this example, I have used white on top of black, but have also used white on top of red earth to good effect. I have not tried dark on light, which could be interesting. The technique has lots of charm because it is very direct. You cannot correct the drawing once you have committed to a line. 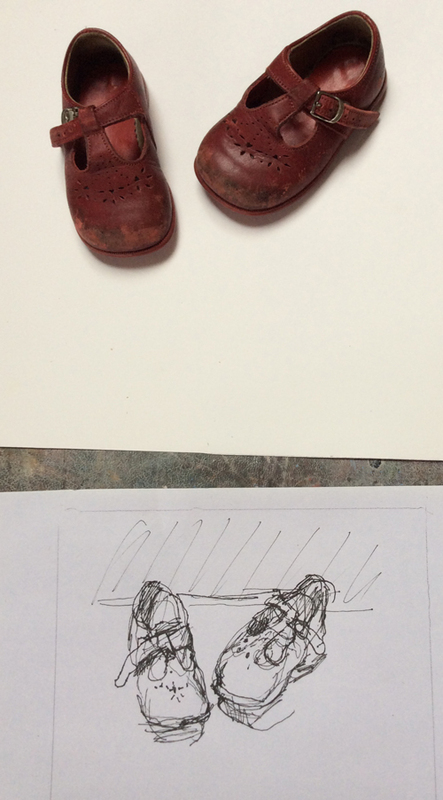 For this one, I chose my daughter’s first pair of shoes. I did a quick sketch in pen first, just to reacquaint myself with the subject. 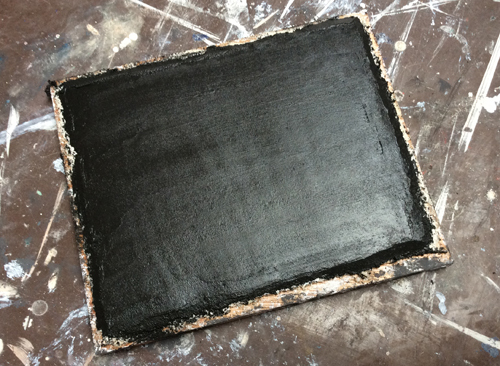 I started the sgraffito by putting a layer of black plaster onto a board prepared with hessian and rough plaster. In order to get a strong black, you have to add quite a lot of powdered pigment. It may look black when wet, but you also want it to be black when dry. I test this out on a sample tile, using a hair-dryer. The black layer is so lovely, like a big slab of liquorice- I nearly couldn’t bring myself to cover it in white. Once it is semi-dry, I spread on lime putty mixed with fine marble powder. 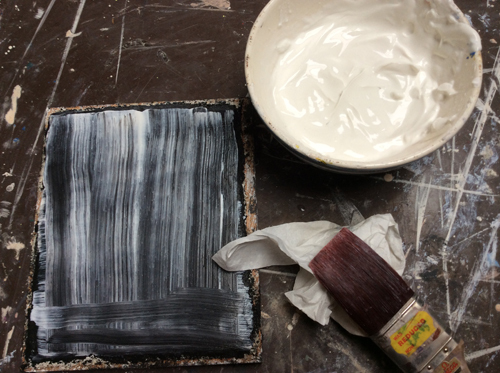 Although it looks streaky, with the black coming through, it will dry a more opaque white. Any anomalies, like unevenness, will add to the finished look. Once it has dried a bit, I can start incising the lines. I use a dry-point needle with a variety of light and heavier touches. I also use a fine brush to get thicker marks and even my fingers to get some soft smudgings. It is possible to add different colours onto the white, as in the buon fresco technique, but I have not done that here. After a certain time the plaster becomes too hard for marks to be made. It is important not to over-work the sgraffito. Its delight lies in the imperfections that result from a spontaneous response. That’s not to say that I wasn’t meticulous in my preparations. I wanted something poignant, not sloppy. 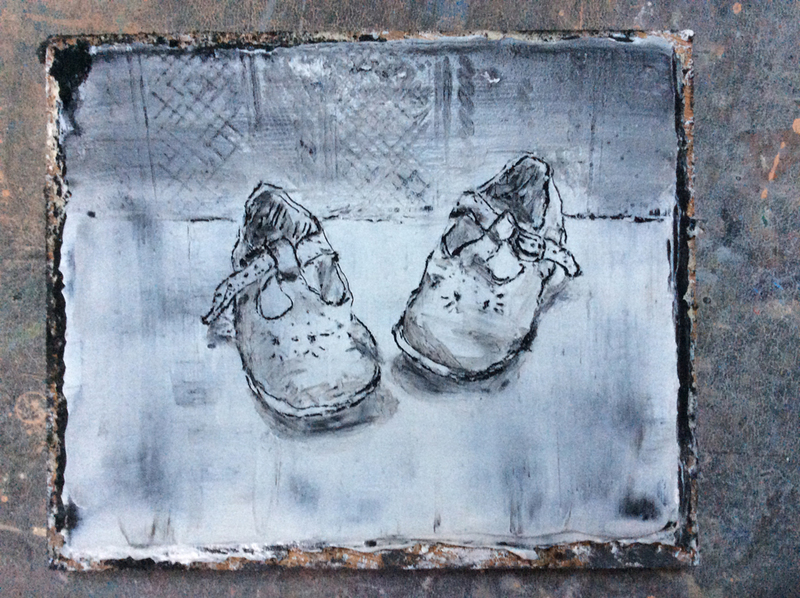 Looking at the finished result, I think it says more about my memory of my daughter toddling about in her shoes than do the real shoes all these years later.